This Oxtail &amp; Butter Beans Recipe is a classic Caribbean dish. It is comfort food at its best and it is a hearty meal made with affordable ingredients. The star ingredients are JCS Oxtail &amp; Stew Seasoning and JCS Spicy Jerk Ketchup. Succulent flavors come alive when this dish starts to boil. Leave your windows closed, you may be forced to share with the neighbors. 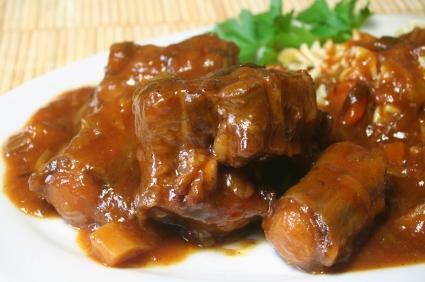 Season oxtail with JCS Oxtail & Stew Seasoning and allow to marinate for at least an hour in a covered container in the refrigerator. Heat cooking oil on medium in a heavy saucepan or, to save time, use a pressure cooker. Brown oxtail in oil on all sides. Add 4 cups of water and bring to a boil. Cover pot and cook on a low simmer for 2.5 hours or until meat is very tender. If using a pressure cooker, make sure to put enough water to cover meat and cook for 30 minutes or until tender. Add JCS Spicy Jerk Ketchup, onions, garlic, thyme and hot pepper and salt. Stir for a few minutes. Let simmer until thick. Add remaining water and butter beans. Lower heat, cover and simmer again for 10 minutes. Best served with rice and peas.